Set deep in the Blue Ridge Mountains of North Carolina, the Yonahlossee Resort & Club started out in 1922 as a summer camp for girls, but took on an entirely different dimension after being converted to a tennis resort in 1987. Then as now guests stayed either in an inn or the cottages and homes on the property and dining in the 1920s stone house now known as the Gamekeeper Restaurant and Bar or other local restaurants. Although the resort's amenities have been expanded to include a spa, fitness center, and pool, tennis at the member-owned private club (though open to guests) remains the centerpiece: outdoors, from May through October on its seven Har-Tru courts, and indoors on three hard courts year round. 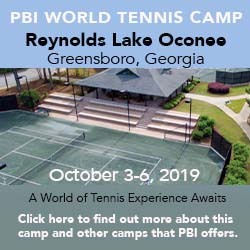 Director of tennis Bryan Dirk schedules a full slate of weekly activities, including adult and junior clinics, men's and ladies nights, Cardio tennis, drill sessions, and Play with the Pro events supplemented by custom-designed programs for tennis teams. All and all, it's a solid program in an exceptional location. For specifics about tennis, visit Yonahlossee Racquet Club. Lodging options begin with rooms at the inn and extend through several sizes of cottages up to 5-bedroom townhomes. Seasons. May-September on the outdoor courts; year-round on the indoor courts. Travel Instructions. By Air: The most convenient airport is Charlotte Douglas International (CLT) in Charlotte, NC, a two-hour drive away much of it along four-lane highway. The alternative is Asheville Regional Airport (AVL), roughly the same distance away but along often narrow roads. General Tourist Information. Visit the Explore Boone Area website. Here's what others have had to say about Yonahlossee Resort & Club. "I've been around the block and know a great place when it presents itself. Well this is one of those diamonds in the rough that has to be recognized as a sweet destination for those tennis (or romantic) endeavors that won't be found elsewhere in the country. The tennis is on 7 clay courts and there are 3 indoor courts for inclimate weather (or winter). The scenary is second to none as trees For honeymooners that love tennis you CAN NOT beat his place for a get away! For those inner-city folk who want to get away to a great destination, far removed from the hustle and bustle, this is the place to be. The staff has the guests first and foremost. Ample social opportinties are provided by the club so new-comers feel at home and welcomed very quickly. The facility also has a full-sized lap pool and 2 workout rooms with adequate equipment to fill the void from your home club. Housing is superb. The cabins and other housing options are SECLUDED, quiet, nicely furnished. Think of the sweetest ski cabin you've ever been to. This equals that for sure.